Digital John Knox. Based on an engraving by J. Cochan. John Knox 500 : by the Presbyterian Mission Agency marking the 500th anniversary of the birth of John Knox. Although John Knox only stayed in this house for a short time before his death in 1572, it was his association with the structure that saved it from demolition in the 1840s. Today, the John Knox House  is the only original medieval building left in Edinburgh. What is a 'testament testamentar'? The document drawn up by the Commissary Court of Scotland sometime after a person's death. 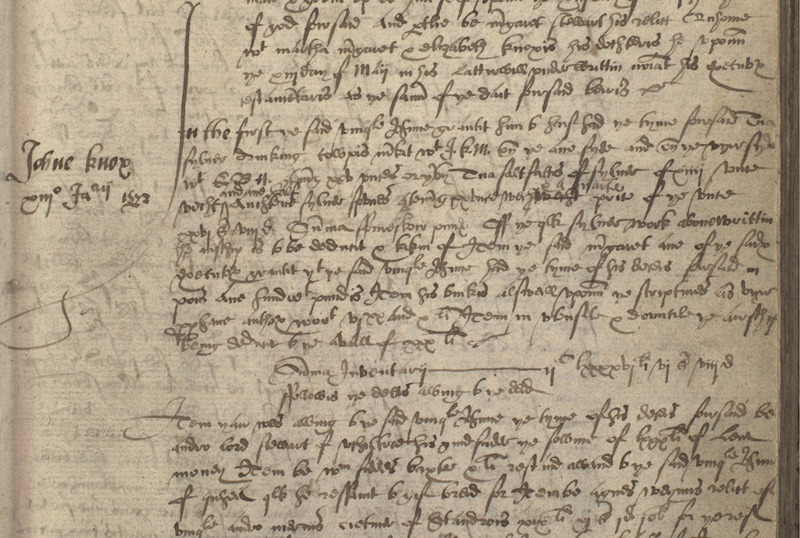 It included an inventory of the deceased's possessions and often a full copy of the will made by the deceased stating his or her wishes regarding the disposal of the estate. It also confirmed executor(s) he or she had nominated. (If a copy of the will was not included, reference was made to it having been recorded elsewhere, probably in the court's Registers of Deeds). 10. testame[n]taris as the sami[n] of the dait foirsaid beiris. ..."
You can also read a modern English summary of the testament testamentar . At the bottom you will find links to the original handwritten testament testamentar. Often regarded as the mother church of Presbyterianism, St. Giles Cathedral was the scene of many fiery sermons from the great reformation preacher. John Knox's statue can be seen within the church, and his grave  lies in the former churchyard (now paved over and used as a parking lot) behind the building. Comedian Andrew Heaton gives his irreverent take on how John Knox's grave ended up in a parking lot .